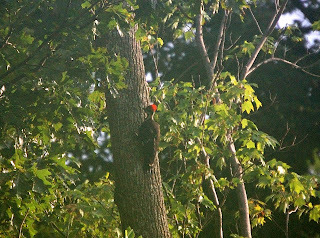 Pileated woodpecker working in the back yard. Native to this area, these magnificent birds are about 2 feet long. Their call is distinctly tropical. No matter how many times I hear it, I stop in my tracks and think how did a toucan get loose? When they hammer a tree it sounds like a construction crew is at work. There are several breeding pairs close by. I feel deeply privileged to share the world with these impressive beings.